Marcie was a signing to President Records US forerunner label Seville Records in 1962. It was a time when girl groups and girl singers in the US were in the ascendancy, and Marcie’s contemporaries included Mary Wells, Little Eva, The Crystals, The Exciters, The Cookies. A then 18 year old, and New York high school student, Marcie outsold the lot that year with her first single ‘Bobby’s Girl’ , a top 5 in the US charts and a major hit around the rest of the world (except the Uk where the cover version by Susan Maughan scored). Marcie had begun only by helping a songwriting friend record some demos but ended up with a three year pop career. 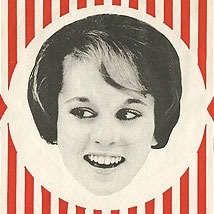 Seville Records swiftly followed up the major hit with ‘What Does A Girl Do’, written along similar lines to appeal to the new teenage market. Initially sold well but lacked radio support in the US when the lyrics were deemed too risqué. A German language version of the song ‘Wer Einmal A Gesagt’ was released, though what the German radio made of the lyrics is unknown. Three more singles were released in 1963, ‘Little Miss Fool’, ‘You Gave My Number To Billy’ , ‘Why Can’t I Get A Guy’. The 1964 single ‘Bobby Did’ was an early composition by Neil Diamond, and was followed by just one more single in 1965 ‘The Hurtin Kind’. All seven singles remain part of the President Records masters catalogue. Loving music but not the music business Marcie left it behind. She graduated as a music major at Queens College (alma mata include Paul Simon) and went on to enjoy a whole new career working in education, as well as raise a family.